A mosaic of tree-dotted wilderness, city excursions, and fun-filled waterparks, Wisconsin is a premier family vacation destination! Find your outdoor oasis at a rustic yet refined cabin, make a splash at Wisconsin Dells' many waterparks, or head into town for a host of attractions at a luxury resort. Nature hikes, water slides, and shopping centers fill your days while star-gazing and campfires highlight the nights. And, with a bevy of family-friendly amenities like game rooms, playgrounds, and swimming pools, you'll find entertainment for everyone! The Osthoff Resort offers four seasons of family fun! 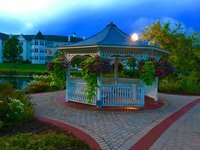 This AAA Four Diamond Resort is tucked away on the shores of Elkhart Lake but also just a stone's throw from a host of attractions. Construct sandcastles on the beach, make a splash in the lake with a bevy of water sports, or stay dry with a family picnic. Barbeque grills, a bonfire area, and a playground provide plenty of onsite fun. Your spacious suite offers relaxation with cozy fireplaces, private balconies, and wireless internet! Additional adventure awaits just outside your door! Explore the vast wilderness on a nature hike through the trails or a canoe trip around the lake. If you'd prefer some urban activities, sensational shopping, family friendly dining, and exciting attractions await in town. When the snow falls, coast on over to The Osthoff Resort is Sunburst Ski Area for alpine adventures. There's truly something for everyone at The Osthoff Resort! The Osthoff Resort is Sunburst Ski Area offers 12 runs and three terrain parks for every level of skier and boarder! The Aspira Spa features private spa suites designed to complement nature, taking in the tranquility, beauty, and energy of the lake. There is no place in Wisconsin that will score you more “cool points” with the family than the Dells. The waterpark capital of the world is filled with hundred of family activities, restaurants, and lodgings. Baker’s Sunset Bay Resort is among the best. Your family will immediately be entranced by the gorgeous lakeside property. Hotel rooms, family-sized suites, and romantic jacuzzi suites are all available, but your family doesn’t care about that; they care about the Dells! Baker’s Sunset Bay Resort is on the “quiet side” of the Dells, away from all the traffic and noise, but close enough so that a daily drive in is easy as pie. Sunset Bay is not as frantic or overwhelming as some of the larger mega resorts but retains the incredible sense of the fun! Located on the densely wooded and lush shores of Lake George, Holiday Acres Resort is one of the leading family resorts in northern Wisconsin lake country. 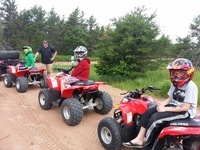 Just east of the town Rhinelander, Wisconsin, Holiday Acres offers your family activities and events no matter of which time of year you decide to visit. The resort has many options when you're ready to choose a room. The rooms begin at single bedroom up to four bedroom as well as cottages and lodges. All the rooms are fully furnished and include ranging amenities such as TV, internet, a/c, sauna, various appliances and unforgettable views of nature. On site the perks continue, the resort has a playground, pool, docks, volleyball, shuffleboard and basketball court. The area has much to offer such as hiking, water sports, geocaching, cookouts, fishing and shopping. Holiday Acres caters to families and has enough activity on and close to the resort to entertain the entire family. Holiday Acres Resort feature an on site gift shop filled with unique items called, Turn of the Century. Check with the staff to find out about the mystery of the Hodag. 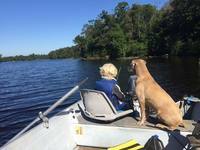 White Birch Village Resort is your resort for family fishing fun! Located in Boulder Junction, "The Musky Capital of the World," you'll likely enjoy battling one of these behemoth fish on White Birch Lake. This 60-acre resort also offers other outdoor adventures like hiking, biking, and boating. When the winter wonderland arrives, strap yourself into a pair of snowshoes and explore the snowy landscape on a family expedition. After exploring the terrain, head back to the rustic charm of your vacation home! Cozy fireplaces, complimentary barbeque grills, and scenic views allow you to soak in the simple life while a bevy of amenities keep you entertained. Catch a tan on the beach, have a family meal at the picnic table, or shoot some hoops on the basketball hoop. The outdoor adventures never end at White Birch Village Resort! The Wildwood Wildlife Park & Nature Center features hundreds of animals that you can get up close and personal with! Though the lake is known for its musky, you can also reel in largemouth bass, smallmouth bass, and plenty of panfish! Located in Hayward, the Northland Lodge if a family-owned-and-operated establishment that provides guests with rustic and charming cabins right on the Quiet Lakes. The location is on 175 private acres in Chequamegon National Forest.This beautiful and secluded natural setting will provide the perfect background for family fun! For a fun an unique experience, have an island picnic! Knott Island in Teal Lake is set up guests to enjoy a picnic there. Northland Lodge is located about 19 miles NE of Hayward. Take Hwy 77, East from Hayward for 15 miles to Dow's corner. Turn left at our sign drive for about one mile on upper A. Turn right at our sign on Brandt's Road and drive 3 miles straight ahead to the Northland Lodge entrance sign at the dead end of Brandt's Road, blacktop road all the way. Surrounded by beautiful Northwoods wilderness, Birchcliff Resort is teeming with family fun! Located in the activity center of Wisconsin Dells, this resort is just three miles from America's largest waterpark Noah's Ark. For some additional outdoor adventures, hike through the tree-lined nature trails, rent a bicycle and pedal through the lush landscape, or find a nearby lake and enjoy a wealth of water sports. If you're more of a city seeker, downtown Dells is less than two miles away! Relax and have fun at Birchcliff's property, which features a host of amenities. Splash around in the heated outdoor pool, roast marshmallows over the campfire, or soak in the Jacuzzi tub. The knotty pine cabin interiors exude a rustic charm while also providing all the creature comforts with a private deck, a barbeque grill, and a family picnic area! Noah's Ark offers splash-tacular fun for all ages! Zip down the water slides, splash around in the pools, or float down the lazy river! Onsite abounds with activities. A basketball court, horseshoes area, and tennis court will keep you entertained! Head to Wisconsin to enjoy relaxing vacations at exquisite locations. With our No. 10 pick, The Conger Collection, you'll have a bounty of accommodations to choose from featuring unique styles, exceptions comforts and everything you're looking for in a Midwest family getaway! The vacation rentals featured through The Conger Collection will help you redefine luxury family travel. Each unit features a range of amenities including full kitchens, spacious great rooms with high-rising ceilings, flat-screen televisions, and more to keep you entertained and comfortable throughout your stay. The privacy offered by these accommodations is unlike anything you've experienced before. Plus, you'll have easy access to the Eagle River Chain of Lakes, the world's largest chain of inland lakes. Spend your days exploring great bodies of water like Eagle Lake, Cranberry Lake, and Catfish Lake. Make sure to bring your fishing pole along for your chance to land a smallmouth or largemouth bass, or a variety of panfish. They'll make the perfect evening meal after a long day on the water. 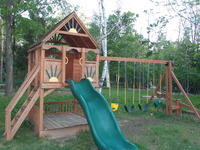 Some of the units have outdoor playground equipment on location, so the kids are sure to enjoy their time in Wisconsin. You can also head to downtown Eagle River to enjoy some of the local shoppes and restaurants. Whatever you do, the time to start planning your Wisconsin family vacation is now and the place to do it is The Conger Collection. To help you get on the water a little more easily, The Conger Collection offers Pontoon Boat rentals. Enjoy a lazy day on the water, exploring the Eagle River Chain of Lakes and the Three Lakes Chain. The nine lakes of the Eagle River chain comprise nearly 3,600 acres of water and when combined with the adjoining Three Lakes Chain, form the largest freshwater chain of lakes in the world. In recent years, the chain has been recognized as one of Wisconsin's most productive musky and walleye fisheries. What do you look for in a family resort? If you're interested in pure, unadulterated family fun and memories galore, Serenity Bay is ideal! For those that crave outdoor adventures in a gorgeous environment, head to St. Germain! You'll enjoy year ’round fishing at its best here, whether you're panfishing in summer or ice fishing in winter. If you prefer something a little more active, hit the St. Germain Biking & Hiking Trail or swing away at any of the 16 nearby golf courses. However you choose to spend your time, make sure you spend at least an afternoon on the lake- an experience at Serenity Bay isn't complete without splashing around in the crystal clear water, exploring the shoreline in a canoe, or grabbing a tan on the beach! The lake has 3 large bays which make for smooth waters for fishing or water sports. Enjoy shopping in Minocqua, Eagle River, Sayner or Boulder Junction – an afternoon shopping adventure will yield unique gifts. You and your family will find charming accommodations, superior hospitality, and countless memories to be made at the scenic Bay Shore Inn! From the moment you enter the Main Lodge fireplace sitting room, you'll be blown away by Bay Shore's commitment to excellence. Spacious quarters are standard, and will make you feel right at home- but so will the friendly staff! Meanwhile, the many recreational activities onsite mean you'll never have a dull moment (unless you want one). Relax on the beach or swim around in the heated pool- there's no wrong way to enjoy Bay Shore Inn! The resort is two miles from Cherry Hills Golf & Lodge, and three miles from the Door County Maritime Museum. Amenities include sports courts, indoor and outdoor pools, and loaner bikes, paddleboats, kayaks and rowboats. A1 Gypsy Villa Resort rests on beautiful Cranberry Lake; it is a majestic retreat surrounded by a stunning chain of 28 connected, navigable lakes between the towns of Three Lakes and Eagle River. This is the largest chain of lakes in the world and offers a truly magical setting for travelers looking to relax and enjoy an adventure. Families come back, year-after-year, to enjoy the many activities and awe-inspiring surroundings at A1 Gypsy Villa Resort! This Wisconsin destination puts you right on the shores of beautiful Cranberry Lake. Venture onto the waters with a pontoon, motorboat, kayak or canoe. Teach the kids how to fish or build a sandcastle on the shores! There's a recreation room onsite as well that's perfect for every family! Surrounded by the Nicolet National Forest, A1 offers a truly refreshing atmosphere. You'll begin to forget all your worries and learn to just unwind. Explore the lake by pontoon, sailboat, canoe, or take out one of their 14-foot aluminum fishing boats for a day. Each of their vacation rentals has its own private lakefront and pier so you can enjoy a truly peaceful experience. Onsite you will find tennis courts, shuffleboard, and a recreation room with a large play center that your kids are sure to love. Regardless of the season, a hidden gem in the beautiful, spacious northwoods of Northwest Wisconsin is waiting for outdoorsmen with a taste for adventure and relaxation. 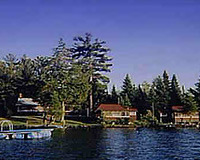 Schatzi’s 4 Seasons Resort, located on the south side of tranquil Cranberry Lake, is the resort of choice because it can be enjoyed at any time of the year. This exciting destination is the perfect place to indulge in everything from relaxation to connecting with nature to trying out a thrilling adventure. Discover over 2,300 acres of spring-fed waters and hundreds of connecting trails throughout the area. Cast your line at the lake for fish, navigate the nature paths on a hiking trip, or ATV across the rugged landscapes. The possibilities are endless at Schatzi’s! Schatzi's 4 Seasons Resort is home to The Chipmunk Bar and Grill. Stop in for drink specials and no-frills dining! Escape the hustle and bustle of the city life and experience northern Wisconsin at The Beacons of Minocqua. Here you and your family can spend quality time together while exploring nature. Any time of year, you and your family can enjoy the many activities that The Beacons of Minocqua has to offer. Here you can hike the trails, take out a boat for fishing, play a game of volleyball onsite, or enjoy a lakeside bonfire in the fire pit at dusk. In the winter, you can enjoy sledding, snowmobiling, and a skating rink. The accommodations at The Beacons ensure that you have a relaxing getaway with plenty of options available. Choose from condominiums, log cabins, or cottages featuring amenities like full kitchens/kitchenettes, fireplaces, spacious living areas, and more. An onsite sauna, pool and hot tub help you relax after a full day of activities. You can also enjoy an activities center, movie rentals and board games with your loved ones. In the midst of the natural beauty you and your family will make memories that you'll cherish for years to come! Bring your family to Popp's resort for fun in the sun. That, and a whole lot of fishing! Whether you choose to stay in a cottage, home, or motel suites, you'll be cozy. Nothing too fancy here- instead, Popp's places the emphasis on the outdoors, where it should be! While there's a ton to do here, undoubtedly the most popular activity is fishing. The area is jam-packed with 443 area lakes and 623 miles of trout streams. Species are divers, and at any moment you could be reeling in anything from pan fish to trout to bass. Fly fishing more your style? Just south of Popp's Resort on the Peshtigo River is a beautiful little spot. Whatever you choose to do, your family will leave with a new respect for the great outdoors! Musky season opens the end of May! Take the stress out of planning your family vacation when you book your next getaway with Sand County Service Company! This Wisconsin destination puts you in the heart of the Dells area and offers a wide selection of affordable accommodations that won't break the bank. Choose from comfortable condominiums to spacious, seven-bedroom vacation homes and find the place that's just right for you! Equipped with modern amenities such as full kitchens, outdoor fire pits, internet access, satellite television and more, you're sure to feel right at home. Many units also feature access to outdoor pools, tennis courts, and hot tubs for extra luxury! Of course, you can't spend all your time indoors. Reconnect with your family as you enjoy all that the Wisconsin Dells has to offer! Known for all its incredible waterparks, you're sure to find a place to splash around with the kids. 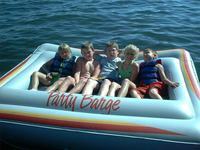 Or, you can head over to beautiful Lake Delton which is a hub for swimming, boating and other water activities. Beautiful Mirror Lake State Park offers over 2,000 acres of adventures; ride the quiet waves of Mirror Lake on a canoe or stick to the winding trails on a refreshing hiking trip. No matter how you choose to spend your time, Sand County Service Company makes it easy to enjoy a memorable family vacation! Don't leave you favorite pet behind at home! 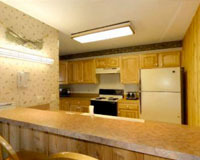 Sand County offers a range of pet-friendly accommodations to ensure no member of the family misses out on all the fun! Need a break from all that water fun? The Wisconsin Dells area is bursting with activities including golf and shopping. Plus, there are over 60 restaurants for you to explore! The Waterbury Inn is centrally located, just minutes from all the fun you can possibly have in Wisconsin's beautiful Door County. Nestled in the woods of North Ephraim, one of Door County’s most picturesque villages, Waterbury Inn Condominium Resort has plenty to do for the whole family. Whether you want to shop, enjoy water recreations, go ziplining, experience fine dining or hang out at the local hot spot; there is something for every family member. Back at the resort, your family can challenge each other in the game room or ping pong room where you can show off your incredible skills. You can also take advantage of the resort's complimentary DVD and bike rentals. Come back after a long day of fun-filled activities and relax in one of their one- and two-bedroom suites at the Waterbury Inn. Their suites provide ideal accommodations for families with a fully-equipped kitchen, a living/dining room area, and a flat-screen television. 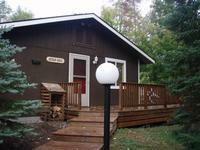 Located on the beautiful Chippewa Flowage, just minutes from Hayward Wisconsin. Spooky Bay is a truly secluded getaway full of everything a fun-seeking family could want. There's nothing scary about that! Spooky Bay Resort is more than capable of accommodating both small and large groups, so feel free to bring the extended family. Quaint, quiet, and very private, Spooky Bay sits on over 10 acres and boasts over 1200-feet of shoreline, the perfect place for kids to swim, fish, or simply play in the sand. All cabins are fully restored, newly remodeled, and stocked with cooking supplies, including coffee pots and microwaves, as well as bath and bed necessities, linens and towels. Despite the name, there's nothing scary about Spooky Bay Resort! Couderay's population was 89 in 2013. Guests also have free use of kayaks, canoes, paddleboards, paddleboats, and the community firepit. Experience all the Lake Geneva area has to offer at Delavan Lake Resort! Situated on the shimmering shores of Delavan Lake, your family will find a wave of aquatic adventures. Get your motor running with world-class boating, dive in for a refreshing swim, or choose from a wealth of water sports. Build a sand castle on the sun-kissed beach shores or catch a tan on one of the lakeside sun decks. Explore the vibrant Lake Geneva area and discover gorgeous golf courses, sensational shopping, and delicious dining! The family fun continues onsite, where you can make a splash both the indoor and outdoor pool. Surf the web with free Wi-Fi access, have a ball in the game room, or stay in shape in the fitness center. Relax with in a Whirlpool soak and soak in the views from your private patio or balcony. Fifty-eight spacious suites provide enough room for families of all sizes. Your family fun center awaits at Delavan Lake Resort! The fun heats up when the snow falls! Snowmobile through the snow-dusted trails or explore the area on foot when cross country skiing. A faster form of family fun is available with downhill skiing adventures! Adults can indulge in a collection of relaxing treatments at Cloud Nine Spa. Choose from a Swedish massage, deep tissue massage, hot rock massage, skin treatments, and much more! Contrary to its name, the Shallows is a resort where you will experience deep relaxation (and tons of fun!). Whether your family is looking for someplace they can brag about to their friends or simply somewhere that they can get outside and burn off their energy, The Shallows Resort is the right place. Resting on the edge of Egg Harbor, the Shallows offers fantastic fishing, be it from dock or one of their kayaks/canoes. They also offer a wide variety of accommodations, from hotel rooms to vacation rental homes, so you’re free to choose whatever best suits your family. Looking to get to know one another a little better? Get the smallest room you can find! There are kayak, rowboat, and bike rentals! The resort is a 3-minute drive from Egg Harbor and 9.6 miles from Peninsula State Park. Heartwood Conference Center and Retreat, comprised of 700 acres of lush woodlands, offers outdoor adventures for every family member! Located on two private lakes and near the Namekagon River, there are so many opportunities for water-fueled fun. Cast out your line for some fishing fun, canoe the scenic shores, and enjoy a wealth of water sports. Stay on land and trek through the nature trails or head into town for family dining and shopping! Once you've had your fill of recreation, enjoy some relaxation back at Heartwood! Lake houses or cottages provide rustic yet refined retreats with outstanding amenities like meeting rooms, an onsite restaurant, and breathtaking lake views. Catch some sun lakeside and then watch the sun dip below the horizon before star-gazing with the family. 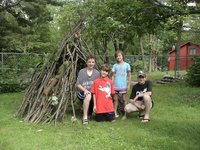 Heartwood offers a family vacation with plenty of heart! Sample delicious eats at The Pine Lodge Restaurant at Heartwood, which is located on beautiful Lake Julia, one of two private lakes on the 700-acre resort property. A breathtaking Northwoods setting and, elegant facilities, and a devoted staff combine to make your dream wedding come true! Tri Lake Timbers Resort & Gardens's eight unique yet similarly luxurious cabins provide an ideal home base from which your family can explore beautiful Iron River! Overlooking the pristine waters of Red Cedar Lake, Stout's Island Lodge offers outdoor entertainment for everybody! Embark on a fishing expedition, canoe or kayak the scenic lake, or hop in for a swim. If you'd rather stay on solid ground, swing away on the clay tennis court, hike the nature trails, or go bird watching. Tee it up at Tagalong Golf, just a stone's throw away. Wrap up the evening with a sticky s'more around the roaring bonfire! When you're ready to exchange exploration for a bit of relaxation, head back to the spacious lodge and drift away. Pop in a DVD and watch a movie with the family, admire pristine wilderness views from your private deck, or curl up beside the fireplace. For large family affairs, reserve a two-story lodge, furnished with period pieces. Your family fun destination is Stout's Island Lodge! Stout’s Island Lodge is listed on the National Register of Historic Places and is a member of Historic Hotels of America. Groups up to 60 people can be accommodated in a variety of unique rooms located in the original Lodge and the recently renovated and expanded Shore Lodge. Assemble the family and depart for one of of the founding resorts in the Minocqua area (and one of the best)- Nitschke's Northern Resort! 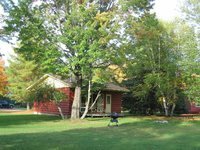 Relax on the private, level, sandy beach on Lake Minocqua, take a hike in the northwoods, or grill some burgers on the charcoal grill; there's any number of ways you can spend your time at Nitschke's. You'll stay in cabins that combine the quaint charm of the northwoods with the modern conveniences of a fully equipped home. Most have two bathrooms, WiFi, cable television, fireplaces, sunrooms, and plenty of plush beds for a restful sleep. Nitschke's Northern Resort is also known for it's amazing location directly off of the Bearskin trail, an 18 mile railroad stretch that has been converted into a level biking trail. Whether you're cross country skiing it in winter or rollerblading in summer is up to you! The resort neighbors Hiawatha Trail and Bearskin State Park Trail, and is 3 miles from the center of town. Amenities include a boat dock, a fish-cleaning station, a sandy beach, a playground and waterfront fire pits, plus sports courts. Whether you're a fisherman, ATV or water sports enthusiast, or just someone looking for a fun weekend, Radtke's Sabinois Point Resort can more than accommodate you! Located on the north shore of Pelican Lake, Radtke's has the luxuries of both a beach resort and a quiet country getaway. Each of its two charming cottages features a lake view, fully equipped kitchens and bath, flat panel cable TV, above ground fire pits, and more. Down by the water you'll find quality fishing and leisure boat rentals, as well as a 100' dock to enjoy the view from. But where Radtke's truly shines is their hospitality. You'll leave feeling like you've made lifelong friends with the staff- and you just might've! Every cabin also comes with its own charcoal grill, so get cookin'! The lodge opened it's doors to the public in the summer of 1965. Woodside Cottages offer a quality and unique lodging opportunity for Bayfield visitor both young and old. That means that both parents and kids are going to find something to love! Each cottage provides a quiet, warm, comfortable and roomy setting as well as spacious grounds where there is lots of room to roam and enjoy the outdoors. The Bayfield area is a treasure chest of fun, and Lake Superior provides an abundance of recreational opportunities. Go for a hike or sit outside with a good book and observe nature in all its Bayfield glory. Meanwhile, your cabin's Jacuzzi, gas fireplace, kitchen, air-conditioning, and porch will make your family never want to leave! Make sure you go enjoy the hundreds of miles of state and forest trails on a snowmobile (in winter). Big Top Chautauqua has been called the "Carnegie Hall of Tent Shows" and provides a variety of top national and local musical talent at the base of Mt. Ashwabay overlooking the lake. If Lakewoods Resort had a slogan, it would probably be something like this: “Lakewoods Resort, where your family will have so much fun they’ll explode!” Maybe that’s a tad dramatic, but you get the point: Lakewoods is an incredible place to bring your family for a vacation. Lakewoods’ name doesn’t lie. Based on the shores of Lake Namakagon, the resort is surrounded by 850,000 acres of Chequamegon-Nicolet National Forest. Take your family on a leisurely stroll along one of the dozens of forest trails and observe how incredible the natural world can be. Then go play a round of world-class golf on the Forest Ridges Golf Course, head out on Lake Namakagon for some prime Musky fishing, or just relax and enjoy the wonderful amenities available in every room. There’s an endless supply of things kids and parents alike will fall in love with. Lakewoods truly puts you and your family front and center for all the fun and relaxation that Wisconsin has to offer. The forest was named a national forest in 1933. Evergreen's vintage cabins come in all sizes and for all kinds of guests, whether you're a couple looking for a cozy dwelling or a family trying to stretch your legs! 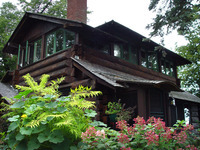 For years the Evergreen Lodge has been an institution for quality getaways. Its location, amenities, and fun will draw you in, but its the incredible hospitality that will keep you coming back. With luxurious porches, kitchens, and inarguable charm, you'll never want to leave. But eventually you're going to go outside, and when you do you'll have so much fun you might not go back inside... ever. Get out on Little Crooked Lake for some fishing, hike on one of the multiple nearby trails, or simply relax and catch a tan. 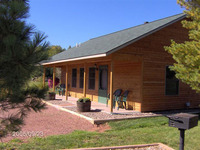 You won't regret coming to Evergreen Lodge.